One of the new features touted by the D3400 is its battery life. Nikon claims it can shoot for 71% longer than the D3300, rattling off no less than 1200 shots before running out of juice. As previously mentioned, the D3400 has lost its in-camera sensor cleaning function, which used ultrasonic vibrations to shake dust off the chip. This could be set to clean when powered on or off, or disabled entirely. The pop-up flash is also less powerful than the D3300’s, so we speculate the reduced flash power and lack of sensor cleaning are the key to this extra battery life. The battery itself is the exact same model. Manually cleaning the sensor isn’t a task that we expect many entry-level users will be comfortable carrying out, so we’re disappointed this feature didn’t make the spec sheet. The majority of the D3400’s core features have been carried over from the previous model. The sensor is still 24.2MP and can produce JPEG and 12-bit RAW files with a maximum resolution of 6000x4000px. The Expeed 4 processor is also the same, although the native ISO has been pushed a notch higher to 100-25,600. There’s a shutter range of 1/4000-30sec with an additional Bulb mode for custom exposures too. The burst rate has not been increased, and stays put at a steady 5fps. All of this technology sits inside a very compact DSLR housing. It’s no smaller than the D3300, with dimensions of 124x98x76mm, though it is a fraction lighter, tipping the scales at 445g (with battery and SD card inserted). On the top of the body you’ll find a hotshoe for attaching an extra flashgun and there’s a pop-up flash here too. As mentioned before, this flash is less powerful – it has a Guide Number of 7 compared to the D3300’s 12. Also on top is a large mode dial with MASP creative modes, Effects, Auto, Auto No Flash, Six Scene modes and a Guide. The latter is useful for those getting to grips with a DSLR, as it explains how to capture certain photos. This includes capturing sharp shots of distant subjects and turning flowing water into an arty blur. At the top of the handgrip is the shutter button with integrated power switch – this makes it very quick to power up and start shooting. There’s a cluster of movie record, exposure compensation and info buttons near the shutter for fast access too. The 3in 921k-dot LCD sits on the back. It’s fixed in place and cannot be rotated, and unlike Canon’s entry-level 100D DSLR there’s no touch functionality. There’s a D-Pad on the back for navigating menus and to set the active AF point. Look through the optical viewfinder and you’ll see the 11 phase-detect autofocus points. There’s a solitary cross-type point in the middle. Although this one is more sensitive, we found the other ten AF points to be very accurate and quick to track down a subject too. SD, SDHC or SDXC cards can be inserted into a port in the grip. On the left side sit the USB and HDMI ports. There’s a Bluetooth logo above these ports to highlight this new feature (see panel above for more info). There’s a Function (Fn) button on the front, which by default lets you adjust ISO quickly. 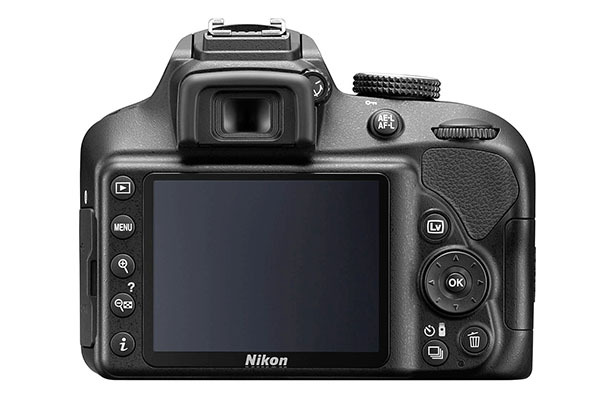 This button can also be set to image quality, white balance or active D-Lighting. The 18-55mm kit lens has a film equivalent of 27-82.5mm when you factor in the APS-C 1.5x crop factor. It’s one of Nikon’s new AF-P lenses and this denotes the optic has a stepping motor as part of the build. This motor is designed to deliver fast and quiet autofocusing. It also has Vibration Reduction (VR), which claims to produce sharp shots at shutter speeds 4 stops slower than would usually be required. The lens is quite compact, thanks to a lock which collapses the barrel length down to 6.2mm when you’re not using it. One thing to note is there are no physical AF/MF or VR switches on the barrel. The lens has a maximum aperture of f/3.5-5.6 and a minimum aperture of f/22-36. We’ve looked at the features, but how does the D3400 actually perform? Well, when it came to autofocusing we were impressed. The phase detection AF through the viewfinder was very speedy using the middle cross-type point, and we didn’t notice too much difference on the other ten standard AF points either. Focusing through the Live View has been a weak point on previous Nikon DSLRs, but we’re happy to say that this was sprightly on the D3400 too. It took fractionally longer to focus, but there was very little hunting to note. The 18-55mm kit lens was also virtually silent when focusing, so there was no annoying AF whir picked up in any of our movies. Our only gripe with the AF was that the 11 AF points are quite central and this makes it a little tricky to focus in the corners of the frame – we often resorted to locking off the focus with the middle AF point and then recomposing to take the shot. Generally, the D3400 is very intuitive to use. The buttons are logically placed and well-sized. There isn’t an overwhelming number of buttons either, which is ideal for those just getting to grips with the basics. The camera also boots up really quickly, so you can get shooting straightaway. That said, there’s no AF/MF switch on the kit lens or body, so this has to be set in a menu and did slow shooting a little. We were also hoping this model would have a touchscreen to make it a little quicker to set the active AF area in Live View and scroll through menus. This feels like a missed opportunity to make the D3400 stand out from the crowd. The top 5fps frame rate is fairly run-of-the-mill, but still quicker off its feet than Canon’s entry-level 1300D, which tops out at 3fps. We found the D3400 was able to clear files very quickly, with only a brief moment taken to write the pictures to the memory card. It never slowed on a continual burst of JPEGs either. We did find the buffer filled after shooting 30 continual RAWs, which slowed the frame rate. But it only took a second to clear the buffer and for us to shoot at 5fps once again. The new Bluetooth feature works with the SnapBridge app available for free on Android and Apple iOS devices. Setup was fairly straightforward and it’s nice that it maintains a low-power connection so you don’t have to set it all up again every time you want to use the app. The app lets you transfer a lo-res 2MP image from your camera to your smart device, making it easy to upload to social media apps such as Instagram and Facebook. That said, this method isn’t really making the most of the D3400’s 24.2MP sensor or RAW capabilities. But we can see the convenience of uploading straightaway. You have the option to send every image to the smart device automatically, but as we found it took around 15 seconds to transfer one image, we much preferred the alternative option – selecting the images you want to transfer. The Bluetooth connection doesn’t allow the D3400 to be operated remotely from a smart device, which is possible on some of its Wi-Fi siblings, such as the D5500. The omission of key features such as in-camera ultrasonic sensor cleaning and the microphone port, and a less powerful pop-up flash, do make it hard to judge the value of Nikon’s D3400. But value is subjective, and if the Bluetooth functionality and minor reduction in weight are more useful to your style of shooting than the features it has lost, then it’s good value. Ultimately, this comes down to your photographic style. Personally, I’d have liked to have seen a touchscreen incorporated to set the active AF point faster in Live View. Wi-Fi would have also been a solid addition, and is becoming a standard feature on many new cameras. If the D3400 had both of these features it would have justified the £489 asking price, but sadly they aren’t. 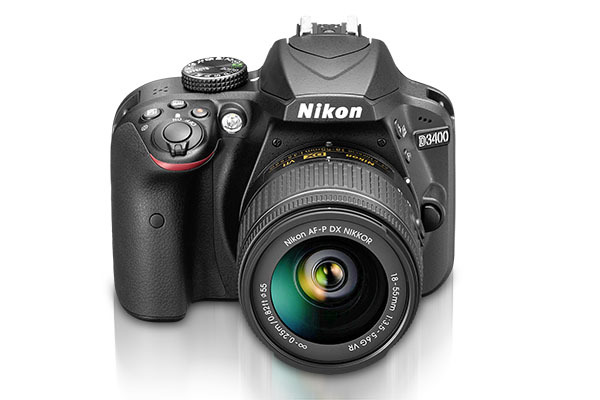 The D3400 is a very good DSLR – it handles well and produces great image quality. But we’re not sure it’s a big enough leap forward from the D3300, which has the same 24.2MP sensor, shares many of its core features and, at the time of going to print, is available £120 cheaper with the same lens. The 100D is a compact DSLR with dimensions just fractionally smaller than the D3400. It has a more attractive price (£379 with kit lens) and a touchscreen. But its 18MP sensor, 4fps burst and nine AF points are a little under par when compared to the Nikon model. Read the full review. Sony’s Alpha 5000 boasts the same-size APS-C sensor as the Nikon D3400, but as a mirrorless camera it’s much smaller, with dimensions of 110x63x36mm. Released in 2014, the Alpha 5000 is getting a little long in the tooth, but it is very good value at £279 with its 16-50mm lens. This review was first published in the December 2016 issue of Practical Photography - download back issues here.